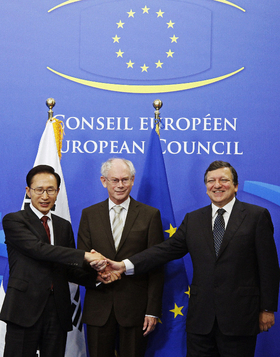 South Korean President Lee Myung-bak (left) is welcomed by European Council President Herman Van Rompuy (center) and European Commission President Jose Manuel Barroso ahead of the signing of an EU-South Korea free-trade deal. Europe's automakers are pinning their hopes on the European Parliament to protect the industry from cheap Korean imports after the EU and and South Korea signed a free trade pact. Fiat S.p.A. and Ford Motor Co. are among automakers that fear the agreement could flood Europe with cheap Korean-built cars. Fiat CEO Sergio Marchionne said the agreement is not a "fair and equitable way of trading." The pact will hurt the European industry's competitiveness, Marchionne told a meeting of ANFIA, the Italian automakers association. The pact is "very one-sided in favor of Korea," Ford Chief Financial Officer Lewis Booth said at the Paris auto show last week. Ford makes most of the cars it sells in Europe in its European factories. Ford of Europe made a second-quarter pre-tax operating profit of $322 million. Korea's Hyundai and Kia carmakers and General Motors Co.'s Chevrolet stand to benefit from the pact. "We are optimistic this will help us. It makes building cars in Korea for Europe more affordable," Chevrolet Europe chief Wayne Brannon said at the Paris show. Chevrolet exports cars such as the Aveo and Spark from Korea to Europe. The brand aims to double European sales to 500,000 in the next six years. ACEA, the European automakers association, says it is not against a deal with South Korea, but the current agreement offers South Korea an unfair competitive advantage and it will set a harmful precedent for existing and future pacts between the EU and other major trading partners. ACEA cites the example of the United States where a U.S.-Korea free trade agreement from 2007 is on hold while President Barack Obama's administration seeks to tackle an alleged imbalance in car trade. The association says any deal should include the scrapping of South Korea's non-tariff trade barriers that ACEA says severely limit the opportunities for European automakers to sell cars in Korea. These include new rules on vehicle emissions and unique regulations outside of international test cycles and standards that require European automakers to carry out costly modifications before their cars can be sold in South Korea. Cars are South Korea's most important export product with 2 million of the country's annual 3 million production exported, according to ACEA, while 74 percent of cars produced in the EU are also registered in the region. "The EU is a key target market for Korean manufacturers," ACEA says. Last year, the EU exported 33,000 cars to South Korea. South Korean-built cars control more than 95 percent of the Korean market. "South Korea has the lowest level of import penetration of any developed country," according to ACEA. The pact was signed on Wednesday at an EU-South Korea summit and is due to come into force on July 1, 2011. The deal will scrap a 10 percent import duty on Korean-built cars exported to Europe but it still needs the approval of the European Parliament. European carmakers will be looking for the parliament to add effective measures to protect the industry from cheap Korean imports. The parliament has already informally backed a provision that will allow Europe to tax or limit South Korean car imports if there is a sudden import surge. The EU-Korea accord will eliminate Korean import duties worth 1.6 billion euros annually and European levies of 1.1 billion euros, according to the EU. The pact could increase Korea's gross domestic product by as much as 5.6 percentage points over 10 years and create as many as 253,000 jobs in Asia's fourth-largest economy, according to a joint report by the country's state research institutes. European companies that may benefit include pharmaceutical producers such as GlaxoSmithKline Plc, chemical makers including BASF and consumer electronics manufacturers like Royal Philips Electronics, as well as farm exporters. Shipping and the financial and legal services industries also stand to gain.